All matches are shown in full! All the wrestlers on the show have profiles on the website, you can click on their names above to go straight to their profile. Like many Joshi events, we kick off the show with the newest wrestler in Marvelous. Miki Tanaka debuted in April of this year, she is 19 years old but looks even younger. Hiroe wrestles out of Pro Wrestling WAVE, she is a few years into her career but is still in the midcard range in WAVE. Hiroe clearly has the advantage but she isn’t so highly ranked that Miki won’t be able to get any offense in. Hiroe and Miki lock up, Hiroe pushes Miki into the ropes and gives her an elbow instead of a clean break. Dropkick by Miki and she hits a few more, but Hiroe regains the advantage and snapmares Miki to the mat before applying a stretch hold. Bodyscissors by Hiroe, she picks up Miki but Miki blocks her slam attempt. Hiroe Irish whips Miki into the corner and hits a dropkick, another dropkick by Hiroe and she hits two more for a two count cover. Crab hold by Hiroe but Miki gets to the ropes, stomps by Hiroe but Miki returns to her feet and the two trade elbows. Miki tries to shoulderblock Hiroe over, she isn’t able to but she knocks Hiroe to the mat with a hard push and hits a scoop slam for two. Miki picks up Hiroe and hits a dropkick, rebound crossbody by Hiroe out of the corner but it gets a two count. Vertical suplex by Hiroe, she goes up top but Miki bops her in the head and tosses her back to the mat. Dropkick by Miki, and she covers Hiroe for two. Miki goes off the ropes but Hiroe rocks her with an elbow, Miki sneaks in a few flash pins but can’t keep Hiroe down for three. Dropkick by Hiroe, she goes up top and delivers a missile dropkick for a two count. Hiroe picks up Miki and delivers a Northern Lights Suplex, but that gets a two as well. Hiroe puts Miki in the Long Beach, and Miki submits! Hiroe Nagahama is the winner. About what you’d expect from a rookie opener. Hiroe continues to improve, she looked better here than last time I saw her, but she is still missing that something special that is needed to really climb up the card. Still, she led young Miki well here and there weren’t any miscommunications. Not a bad way to kick off the show. One of the fun things about watching a promotion that rarely makes TV is you get to see wrestlers that have been way off the radar. Yuiga is a part time wrestler and is so far underground in the Joshi scene that she hasn’t been on a televised show in years and hasn’t won a title even though she is 16 years into her career. Yako is a bit better known, she is a young wrestler from PURE-J, formally known as JWP. Natsu is from Pro Wrestling WAVE, while Aki Shizuku is affiliated with Marvelous and last won a title back in 2014 in REINA. Yako and Shizuku double team Natsu to start the match since she was being rude to them, but Natsu hits a jumping neck drop on both of them and tags in Yuiga. Scoop slam by Yuiga to Yako and she rolls over her a few times before covering her for two. Yuiga goes to tag in Natsu but Natsu isn’t interested, Yako takes over on offense and makes the tag to Shizuku. Shizuku elbows Yuiga but Yuiga elbows her back and they trade blows. Camel Clutch by Shizuku and she throws Yuiga into the corner so she can choke her with her boot. Shizuku tags Yako back in, Yako puts Yuiga in the Muta Lock and then into a stretch hold but Yuiga gets out of it. She tries to tag in Natsu but Natsu still isn’t interested, suplex by Yuiga to Yako and she gets a two count. Yako knocks Natsu off the apron and hits a hip attack onto Yuiga, Yuiga tags Natsu against her will and Yako knocks her down with a hip attack. More hip attacks by Yako, she picks up Natsu but Natsu elbows her off. Yako returns fire and they trade shots until Natsu hits a neck drop. Hip attack by Yako and she hits a Northern Lights Suplex, but Natsu kicks out at two. Yako tags in Shizuku, lariat by Shizuku to Natsu in the corner and Yako returns to help Shizuku hit a body avalanche. Natsu comes back with a running boot, bridging suplex by Natsu and she gets a two. Natsu throws Shizuku down in the corner and hits the Bronco Buster, she goes up top and delivers a diving crossbody for a two count. Big lariat by Shizuku and she hits a chokeslam, cover by Shizuku but Natsu barely gets a shoulder up. Shizuku picks up Natsu while Yako goes up top and hits a missile dropkick, Natsu lands in her corner and tags in Yuiga. High kick by Yuiga and she hits a swinging neckbreaker, she picks up Shizuku but Shizuku elbows her off. Shizuku goes for a Death Valley Bomb but Yuiga slides away and rolls her up for two. Fisherman suplex hold by Yuiga, she goes up top but Yako runs in and tosses her to the mat. Spear by Shizuku to Yuiga, Yako goes up top and hits a diving bodypress, cover by Shizuku but it gets a two count. Shizuku picks up Yuiga but Yuiga knees her off and hits a German suplex hold for two. Yuiga picks up Shizuku but Natsu boots Yuiga by accident, lariat by Shizuku to Natsu, she then nails a Death Valley Bomb onto Yuiga for the three count! Aki Shizuku and Yako Fujigasaki win! There was a bit of a storyline coming into the match that I didn’t fully grasp since I don’t understand Japanese, but it was an odd match. Natsu didn’t want to be Yuiga’s partner so she wasn’t being overly cooperative, and its hard to win a tag match when your partner isn’t breaking up pins and what not. Shizuku looked pretty solid though, she stuck out the most in the match, but overall not a whole lot to it. For a midcard match on a non-televised show, this is a pretty big match. Tsukasa and Arisa, better known as Best Friends, were one of the top tag teams of 2015 and 2016, winning tag titles in several different promotions. This year, they took a bit of a break doing their own thing, but they have been teaming more often recently and hopefully will continue seeing success as they work together really well. On the other side, Mio and Maruko are both young wrestlers that have shown early promise and hopefully are future stars for their promotions (Ice Ribbon and Marvelous, respectively), they could learn a lot from one of the best tag teams in recent Joshi history. Mio and Maruko attack Best Friends before the match officially starts, they dropkick their opponents into the corners repeatedly but Best Friends recover and return the favor. Tsukasa stays in with Mio and tosses her around before tagging Arisa, Arisa armdrags Mio to the mat before putting her in an armbar. Scoop slam by Arisa and she tags Tsukasa back in as they take turns on offense against young Mio. Mio finally gets away and tags in Maruko, but Arisa immediately scoop slams her, Tsukasa comes over but Maruko fights them both off and dropkicks Tsukasa in the chest. Elbows by Maruko but Tsukasa dropkicks her, she puts Maruko in the ropes and dropkicks her in the back. Tsukasa tags in Arisa, big boot by Arisa to Maruko and she hits a dropkick off the second turnbuckle. Maruko elbows Arisa and they exchange shots, scoop slam by Maruko but Arisa stops her from tagging out and hits a backdrop suplex. Dropkick by Maruko and she finally tags in Mio, Mio dropkicks Arisa a few times but Arisa boots Mio in the head. Dropkick by Mio, she picks up Arisa but Arisa knees her in the head and hits a running boot. Maruko comes in and with Mio they dropkick Arisa, Cutie Special by Arisa and she makes the tag to Tsukasa. Maruko again comes in and they double dropkick Tsukasa, diving crossbody by Mio and she picks up a two count. Elbows by Mio but Tsukasa doesn’t go down, Maruko again comes in and they both take turns elbowing Tsukasa. Tsukasa dropkicks both of them to the mat, Tsukasa puts Mio in a crab hold but Mio gets into the ropes. Tsukasa gets Mio on her shoulders but Mio rolls out and cradles Tsukasa for two. Mio goes off the ropes and rolls up Tsukasa, but Tsukasa kips up and kicks Mio in the head. Arisa comes in and they both dropkick Mio in the corner, Tsukasa goes up top and she hits a missile dropkick for a two count. Arisa suplexes Maruko to get her out of the ring, PK by Tsukasa to Mio but Mio kicks out of the cover. Tsukasa gets Mio on her shoulders again and this time she delivers the Japanese Ocean Cyclone Suplex Hold for the three count! Best Friends win! Oh boy, what a special little match. Besides being a traditional inter-promotional feud, with Marvelous vs. Stardom, it goes a bit deeper than that as Takumi Iroha trained in Stardom and was a wrestler there until 2015. So she and HZK have some history, as they both were young wrestlers in Stardom at the same time and were a semi-regular tag team until Takumi left. 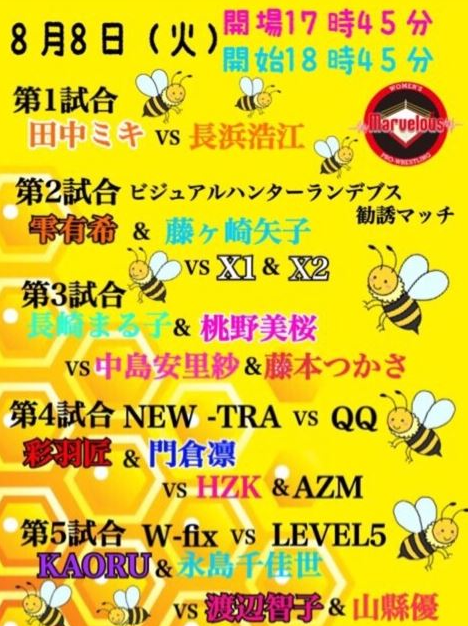 Of course, a lot has changed since then as now Takumi is the young future Ace of Marvelous while HZK is moving up the card in Stardom as part of Queen’s Quest. This is Takumi’s first interaction with Stardom wrestlers since leaving over two years ago, so its definitely more than your average match. Rin and AZM are the first two in, Rin pushes AZM against the ropes but she gives a clean break. AZM quickly takes Rin to the mat and they struggle for position before reaching a stalemate. Takumi and HZK are tagged in, Takumi goes for a waistlock but HZK quickly reverses it as they go back and forth. Irish whip by HZK but Takumi shoulderblocks her down, HZK kips up and goes off the ropes, but Takumi hits an armdrag. HZK rebounds off the ropes and hits an armdrag of her own, and they too end up facing off across the ring once again. Takumi and HZK lock knuckles, knee by Takumi and she hits a scoop slam followed by a body press, but AZM breaks up the cover. AZM stomps on Takumi and with HZK they double team her until Rin runs in to help. Kick to the chest by Takumi to HZK, double Irish whip and HZK eats a double back elbow. Dropkick by Takumi to the face, leg drop by Rin and they hit an assisted face buster onto HZK for two. Takumi tags Rin, Rin goes for a dropkick but HZK side steps it and hits a scoop slam. She tags in AZM, AZM puts Rin by the ropes and hits a series of footstomps. Scoop slam by AZM, HZK returns as legal and dropkicks Rin in the chest. Kick to the back by AZM but Rin hits a dropkick and tags Takumi. Takumi elbows both AZM and HZK, she goes for a suplex but HZK gets in the ring to help. Takumi instead hits a vertical suplex on both of them, kicks by Takumi to HZK and then then superkicks AZM to make her DDT AZM. Takumi kicks AZM in the back, scoop slam by Takumi and she tags Rin. Dropkick by Rin but AZM bridges out of the pin. AZM goes for a crossbody but Rin catches her, scoop slam by Rin but AZM slaps her in the face. AZM goes off the ropes and applies a hanging armbar, schoolboy by AZM but it gets two. AZM dropkicks Rin in the corner but Rin returns the favor, two more dropkicks by AZM and she covers Rin for a two count. AZM tags HZK, dropkick by HZK and she applies a dragon sleeper. Rin gets to the ropes for the break, HZK goes off the ropes but Rin dropkicks her. Another dropkick by Rin, she picks up HZK but HZK sneaks in a cradle for two. HZK goes for the Pump Kick but Rin ducks it and tries a few flash pins of her own, none getting her the three count. Rin goes off the ropes but HZK chops her to the mat, HZK slams Rin in front of the corner but Rin avoids the diving senton. Hurricanrana by Rin, but HZK gets a shoulder up. Rin tags Takumi, kicks to the chest by Takumi and she dropkicks HZK in the corner. HZK avoids her next charge however and hits a dropkick of her own, bootscrapes by HZK and she nails the running boot to the side of Takumi’s head. Takumi elbows her back and the two trade blows, slap by HZK and she delivers the full nelson slam for two. Armtrap crossface by HZK while AZM takes care of Rin, HZK lets go after a moment but Takumi slaps her in the face. Superkick by Takumi, but HZK kicks out of the cover. Takumi deadlifts HZK and hits a release German, Rin comes in and they double team HZK. Takumi gets on the top turnbuckle but HZK recovers and joins her, elbows by HZK but Takumi knocks her back to the mat and delivers the Frog Splash for two. Takumi picks up HZK but HZK blocks the powerbomb, Takumi goes off the ropes but HZK hits the Pump Kick for a two count cover. Codebreaker by HZK and she applies a bodyscissors into a cradle for two. HZK tags in AZM, diving crossbody by AZM and she hits a tilt-a-whirl headscissors. Dropkick by AZM and she goes for a suplex, but Takumi reverses it into a suplex of her own. Takumi goes for a powerbomb but AZM reverses it into a cradle, bridging cover by AZM but Rin breaks it up. AZM picks up Takumi and hits a vertical suplex, she gets the Wing Clutch applied but Rin breaks it up again. Takumi kicks AZM in the head, she picks her up for the powerbomb but HZK breaks it up. Rin comes in too and they both superkick HZK, kick to the head by Takumi to AZM and she covers her for two. Takumi positions AZM, she goes up top and nails the Swanton Bomb for the three count! Takumi Iroha and Rin Kadokura win! This match is celebrating KAORU’s wrestling anniversary. At 48 years old, KAORU is still trucking along and is officially on the Marvelous roster, however she is a regular in Sendai Girls’ as well. Chikayo is also a Freelancer and is a 22 year veteran, she mostly wrestles in Marvelous and Diana. On the other side, I haven’t gotten to see Tomoko Watanabe in awhile, she is a 27 year pro that is best known for her work in AJW where she won many championships. Yuu Yamagata is a long time vet that currently wrestles in WAVE, so there are no clear weak links in this match has all have had a fair amount of success in their careers. There are weapons scattered around as the bell rings, which happens prematurely as Chikayo and KAORU attack their opponents as they are getting into the ring. Chikayo and KAORU take their opponents into the crowd and around the ring before finally returning, with Chikayo holding a chair while KAORU has her ladder. Tomoko gets in the ring first but it immediately double teamed, KAORU puts the ladder around her neck and helicopters it into both of her opponents. Tomoko is driven into a chair, another chair is put on top of her before both Chikayo and KAORU drive the ladder down on top of her. They then set up the ladder, KAORU climbs it but Yuu runs in and pushes it over, sending KAORU crashing out of the ring. Yuu stays in as the legal wrestler and trades blows with Chikayo, kick to the head by Yuu and she chops Chikayo repeatedly in the chest. Yuu charges Chikayo in the corner but Chikayo boots her back and hits a headscissors, running boot by Chikayo and she tags in KAORU. Double boot to the face to Yuu and they hit a double vertical suplex, KAORU picks up Yuu and delivers a delayed brainbuster. Cover, but Tomoko breaks it up. This gives Yuu time to recover, high kick by Yuu but Chikayo grabs her lag before she can tag in Tomoko. Yuu kicks Chikayo back and tags in Tomoko anyway, Tomoko clears house with lariats before covering KAORU. KAORU bridges out of the pin, she gets her wooden board and whacks Tomoko repeatedly in the head with it until the board breaks. She hits her with it some more for good measure, Tomoko is bleeding at this point while Chikayo drives the board onto her head. Frankensteiner off the top but Chikayo, hurricanrana by KAORU to Tomoko but Yuu breaks up the pin attempt. Yuu stays in to help but gets a chair thrown at her, Tomoko drops KAORU with Screw Driver but Chikayo breaks it up. Another one by Tomoko, but KAORU kicks out at one. Chikayo comes in and hits Tomoko with a chair, she takes another board shot but Tomoko fires back with a lariat to KAORU. Tomoko finally tags in Yuu while Chikayo is also tagged in, Chikayo drives Yuu’s head into the mat but Yuu fires back with a dropkick. Yuu goes up top and she nails a missile dropkick, but KAORU hits Yuu with the board which allows Chikayo to hit an uranage. Chikayo goes up top but Tomoko hits her from the apron, Yuu recovers and joins Chikayo, hitting a superplex. Somato by Yuu, but KAORU breaks up the cover. Yuu goes for a high kick by Chikayo blocks it and hits the fisherman buster, but Tomoko interrupts the pin. Chikayo picks up Yuu but Tomoko lariats her, front suplex by Yuu to Chikayo but KAORU breaks up the pin. Buzzsaw Kick by Yuu but KAORU hits her in the back of the head with the board, Tomoko hits KAORU but Chikayo spits mist in he face. KAORU returns and spits red mist into Yuu’s face, fisherman buster by Chikayo to Yuu and she picks up the three count! KAORU and Chikayo Nagashima win! For a smaller event that the vast majority of fans will never get to see, I thought they really put on a fun show. The first two matches were nothing special but everything after that had some type of purpose. Its always a pleasure to see Best Friends together, and the Stardom vs. Marvelous match was a quality start to hopefully a continuing feud. The main event was crazy, but in a good way and entertaining. Its a hard event to track down, but a solid show top to bottom.